Making use of the sun - face your house the right way and it's easy! 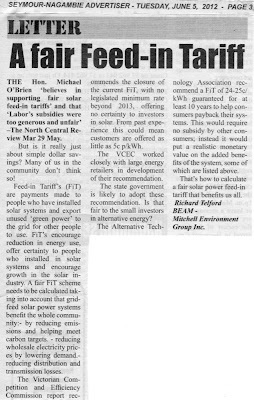 In my last Solar PV post, about a six months ago I mention the challenges that we were having getting the Premium Feed-In Tariff (PFiT) that we signed up for. It was a very long process to get sorted out, but we got there eventually. For those of you that are interested you can follow the story later in this post - The battle for our PFiT. I really wanted to focus this post on our reduced energy use since installing our own solar PV system. I've found that when I take personal responsibility for collecting resources myself (like electricity / water / wood) I respect those resources more and reduce my consumption. I have a greater awareness of how much energy there is around me and how to make the best use of it. Typical household (av 2.7 people) use in NSW is around 7300 kW/h per year, we used 852.6 kW/h with a family of four - or about 12% (1/8th) of the electricity of a typical household. This is including supplying power for a home business and pressure for our own water system. It's also good to consider that we prepare most of our own food from scratch and spend the majority of our time at home with the kids. My estimates before getting the system installed was that we would generate a revenue of about $640 per year, an amount that would reduce as power costs increase. Over the first 11 months we actually received about $800. I attribute the larger amount to both the 23% reduction in energy use since installing solar system, which I didn't factor into my equations. There's a real incentive to reduce power use when good FiT's are made available - the more you export, the more income you generate. Also, the system generated more electricity than I anticipated, resulting in a higher income. We became more vigilant at turning the switch off at the power point, rather than leaving appliances left on stand-by and are also more aware of turning lights off when not needed. I also installed an Embertec Smart Switch for our computer. Whenever the computer - any type of computer - goes into standby, hibernate or off mode, power is removed from all of the connected peripheral devices. Power is immediately and automatically restored when the computer is reactivated in the normal way. The thing that I don't like about this system is that it ejects mounted external hard drives when ever the computer goes to standby. I got this device for free as part of a local program, but I think that most people would be better off to switch the power off at the point if it's easy to reach, if not then purchase a remote power point and move the switch to a more convenient location. If you can't remember to to this then the Embertec product could be a wise investment. 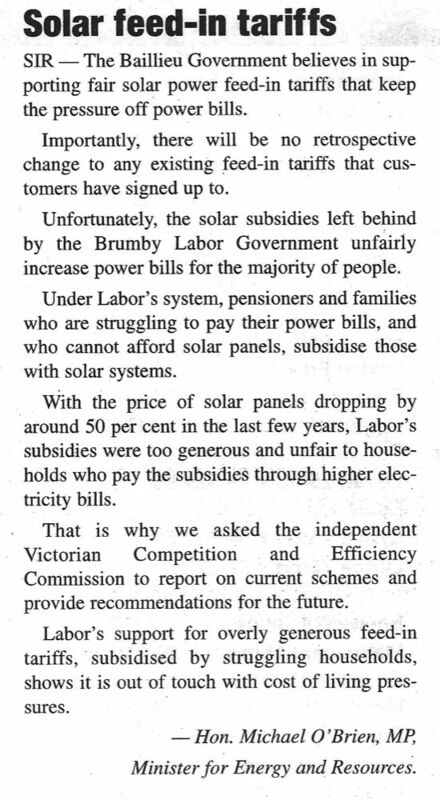 While I demonstrated that a good feed-in tariff provides an incentive to reduce energy use (and therefore carbon emissions) the state government is looking to drastically reduce them. This letter to the editor appeared in one of our local papers that demanded a response. I wrote a follow-up letter to the editor, as part of my role in BEAM, our environment group, explaining the real value of feed-in tariffs, and why a fair tariff should should be allocated. 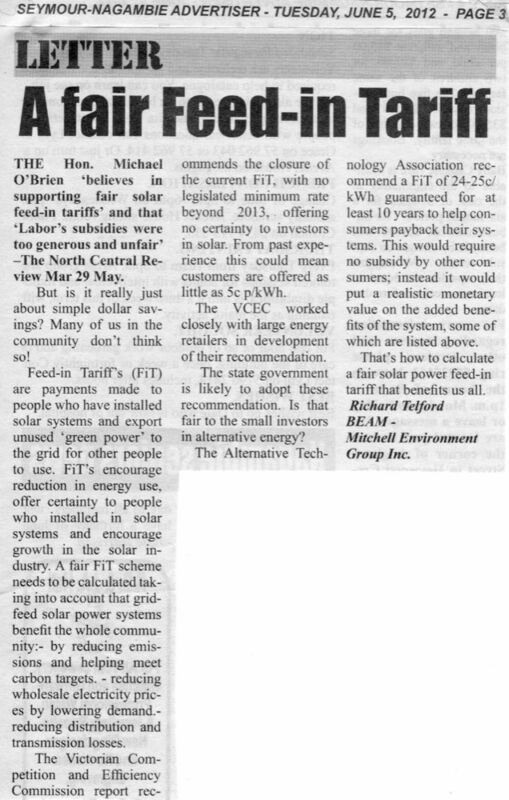 I got a 1.5kW system installed through Origin in July 2011, letting them know at the time that I wanted a PFiT (a 66c rate that was on offer at the time to stimulate the industry). After a notice from ATA that the PFiT was ending I rang up to confirm that I was actually receiving it I rang up Origin to confirm. I found out that I needed to fill out a contract and send it to them before I could get it! I received an email back confirming that I would receive the PFiT. Glad I called them. I wrote about this on my blog. Origin have not yet made me an offer since they admitted fault in January. I have been on their case ever since and got in touch with the Ombudsman in February, 3 weeks ago. Their time is now up. Origin claim that there are other people with the same issue and that they are working out how to deal with this at higher management. Just wondering if there is anyone else out there in the same boat and what they are doing about it? Any other advice. The first was one year of estimated income from PFiT that I would miss out on plus $500 for the trouble. $1400 in all. I rejected the offer. Next was an offer of $3500 - which I rejected based on the fact that Origin told me that I would be fully compensated for not getting the PFiT. I now have updated my claim with more recent figures in how much electricity I export to the grid. From 29/7/11 (date system was turned on) until 22/5/12 the system exported 1725.6 kW/h, averaging 5.81 kW/h per day. 365 x 5.81kW/h = 2120.65 kW/h over one year. I signed up for the PFiT on the 11th of August 2011. I understand that the PFiT runs until 1st November 2024, which is about 13.25 years that I should be receiving the PFiT. 13.25 years x 2120.65 kW/h per year = 28,098 kW/h over the life of the contract. The difference between the standard feed in tariff and the PFiT is (66c - 23.5c) 42.5c. I expect that I would miss out on (28,098 x .425) $11,941 over the life of the contract based on these figures. That is my claim for compensation for which Origin has admitted fault and assured me that I would receive. This is about $3,000 lower than my original claim, as I assumed that the contract was for 15 years from when I installed the system. When Origin makes an offer of compensation then I expect that I will be "fully compensated for the PFiT" as they have told me via email. I would like to see how they calculate any subsequent offer to ensure that I am fully compensated. Since rising through the ranks of the EWOV (Ombudsman) with my case, and the matter continually escalating (how high can it go?) we finally came to a resolution. After the admission of fault from Origin that I was not signed up for the PFiT, and assurance that I would be fully compensated I was initially offered one years export (difference of what I should have been getting and what I got) plus $500 for my trouble. $1400 in all. The contract was for 13 years so I refused - not fully compensated. Next I was offered a flat $3500 from Origin, which was was I paid for the system. Again I refused as that was not what I signed up for, nor full compensation. I reduced my request for settlement to $12,000, based on the contract being shorter than I originally thought it was (13 years, not 15 years), and using readings over a longer period to base an estimate. I later found out that this should have increased as the FiT that I was getting will soon (probably) be lowered. Finally I was told that I WAS in fact signed up for the PFiT, and that I would be receiving the 66c tariff. So I am to be paid what I am owed since signing up on 11th August last year, am on the PFiT (so I can transfer to another retailer), and will get a $500 credit as compensation. Thanks for the advice and support from Damien and Craig from the ATA. I'm glad I stuck it out and continued to pressure Origin. Also thanks to the EMOV conciliator - I don't feel that this could have been resolved by going directly to Origin. 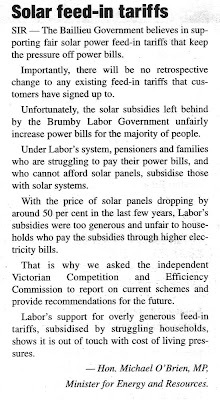 I'd highly recommend complaining to the Ombudsman if you can't resolve an issue with your energy retailer directly. Hi Richard, good on you for persisting. We also had to contact the ombudsman last year because our retailer were giving us a high estimate. We knew for a fact that the meter man had been because I know him and had been chatting to him. Yet they still insisted on using the estimate. At that point we were using about 7 kWh per day and they were charging us for 15! The company were very obliging after we contacted the ombudsman. It just shouldn't be so hard, should it? !